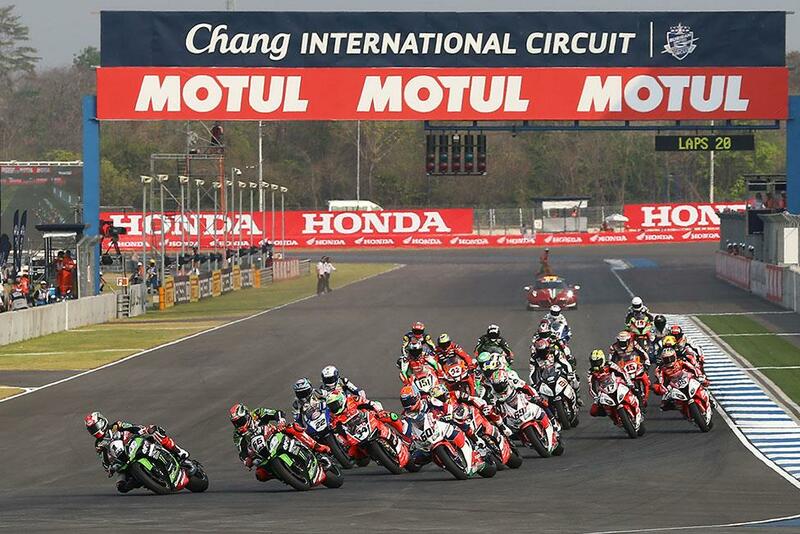 Jonathan Rea (KRT) kept his 100% record rolling into the third race of the new season with a close win over his team-mate Tom Sykes after 20-laps at an overheated Buriram circuit in Thailand. Rea and Sykes swapped the lead, and when Rea ran wide Sykes took the front position until Rea’s lap of 1’33.936 on lap 14 brought him to, and then soon past, Sykes. Rea looked like he would win running away but Sykes kept his pace behind and when Rea had to change his plan waiting to pass a backmarker Sykes drew himself tantalisingly close on the final lap. Over the line Rea won by just 0.222 seconds, with Sykes taking his first podium of the year. Almost ten seconds back, a lonely final race for Michael van der Mark (Honda World Superbike Team) put him third, keeping up his consistent podium run, but the Superpole qualifier could not match the pace of the KRT runners, especially after running wide at one point. A fight between team-mates Chaz Davies (Aruba.it Racing - Ducati) and Davide Giugliano (Aruba.it Racing - Ducati) was resolved when the latter ran off line and fell, scoring no points and leaving Davies fourth – but a significant 17.167 seconds from Rea’s winning mark. Young German charger and WSBK rookie Markus Reiterberger (Althea BMW Racing Team) made a great race for himself in the final analysis taking fifth place and only ending up 1.7 seconds from the factory Ducati of Davies. 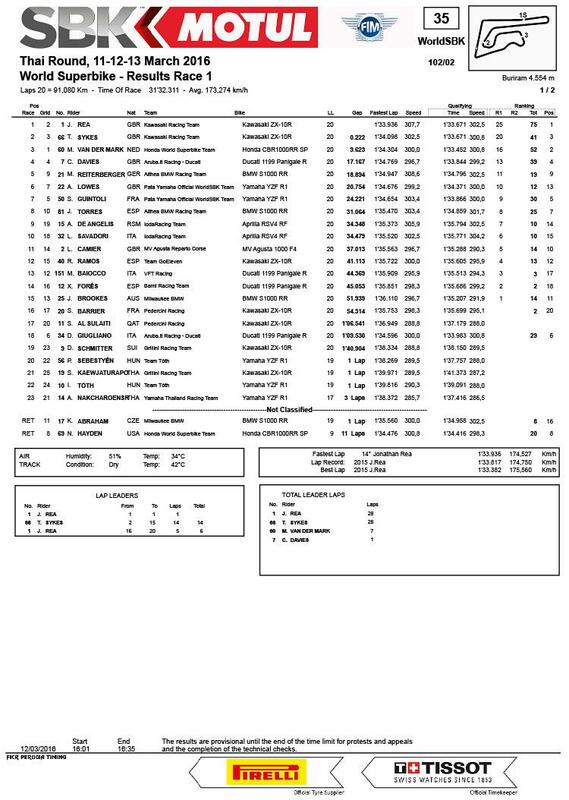 British rider Alex Lowes (Pata Yamaha Official WorldSBK Team) placed sixth, his team-mate Sylvain Guintoli (Pata Yamaha Official WorldSBK Team) one behind and Jordi Torres (Althea BMW Racing Team) eighth – and over 30 seconds back on a hot day in Thailand. 11th and privateer Kawasaki rider Roman Ramos (Team GOELEVEN Kawasaki) 12th. Nicky Hayden (Honda World Superbike Team) was forced out at half race distance with machine problems.